For a variety of reasons, small but intense cyclones are very poorly predicted over the Arctic even by the most skillful NWP models. The inability to predict this forcing is a predictability barrier that must be overcome if intra- and interseasonal predictions of sea ice are to become a reality. The overarching objective of this DRI is to gain a new understanding of the basic processes governing the development and evolution of Arctic cyclones as well as their relationship to tropopause polar vortices (TPVs) and their influence on coupled air-sea-ice processes. The Moderate Resolution Imaging Spectroradiometer (MODIS) on NASA’s Aqua satellite captured this natural-color mosaic image on Aug. 6, 2012. 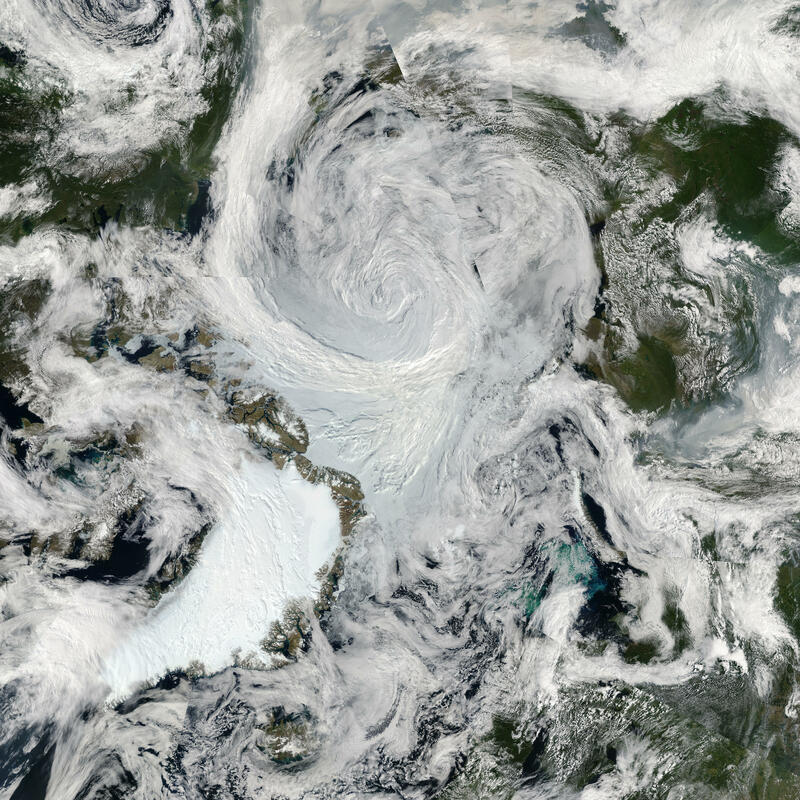 The center of the storm at that date was located in the middle of the Arctic Ocean. Can multi-scale modeling systems be used to bridge the climate/weather domain inhabited by Arctic cyclones and TPVs and increase predictability of this seasonal driver of smaller scale forcing events? What factors influence the predictability of Arctic cyclones and what are the most important parameters and observations required for skillful forecasts of high-latitude cyclones and smaller-scale polar lows? How do air-sea-ice interaction processes occurring at the lower boundary respond to the influence of Arctic cyclones? How does the ocean-ice boundary morphology influence polar low genesis? What processes contribute to the intensification, properties, precipitation, and evolution of Arctic cyclones and their interactions with clouds and the boundary layer? This DRI is expected to run for five years, from FY18 to FY22. For more info on the DRI, visit the ONR Arctic DRI page. The Arctic Cyclone DRI kick-off meeting took place in Monterey, CA on May 30-31, 2018. Over the two day meeting, the PIs presented their proposed projects and discussed future avenues of collaboration. DRI PIs can find more info by logging in here. The DRI looks to collaborate with the other Arctic initiatives that are to take place over the next several years. Many of these are endorced by the WMO's WWRP/Polar Prediction Project (PPP). and can be found via the Year of Polar Prediction Explorer. This ONR Departmental Research Initiative (DRI) is to enhance the understanding of dynamics of Arctic cyclones and their relationship to the tropopause polar vortex (TPV). The DRI is motivated by recent studies which lent support to the hypothesis that year-to-year variations in sea ice are driven to a great extent by a relatively small number of intense storms—Arctic cyclones. This page is coordinated by Dr. Andrea Lang at the University at Albany, SUNY as part of the DRI.